An extremely small,lightweight and portable laptop raiser. 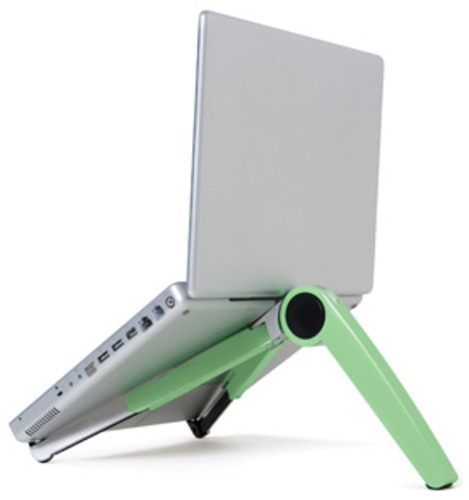 It adjusts to fit all widths of laptops, and will accommodate laptops weighing up to 5.4kg. Designed to be used with a keyboard and mouse, it can then be folded up for transport in a pocket or laptop bag. It is made of 70% recycled material, and comes in white, green and black. adjust height of screen, 6 heights levels. Model Cricket Laptop Raiser: Available in Different Materials and Sizes. Please call first to make sure the product and staff are available and to confirm the model on display.